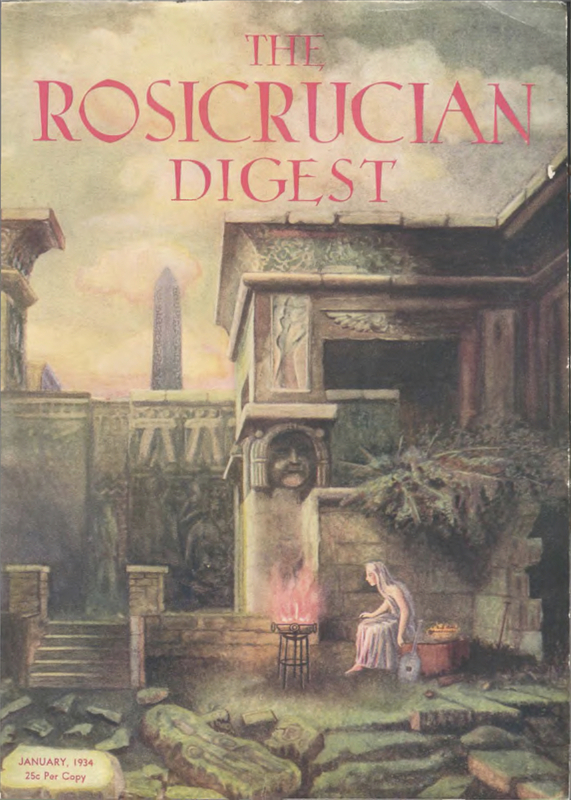 The Official International Rosicrucian Magazine of the World-Wide Rosicrucian Order. San Jose, CA. Publisher: Supreme Council of the Rosicrucian Order [A.M.O.R.C.]. Editor: H. Spencer Lewis, then Ralph M. Lewis. 7/9, October 1929-current. Continues volume numbering of the Mystic Triangle. $3.00 a year, 32-40 pp. This journal reflects the decision of H. Spencer Lewis to concentrate the propaganda function of his organization into the Rosicrucian Digest, while reserving the more private lessons of his students for the companion Rosicrucian Forum. Lewis wrote in the journal as "Imperator,""Royle Thurston" (the pseudonym he had earlier used in writing for The Future), and other names. The journal included generic articles on the Rosicrucians and their history, Christian occultism, psychic development, and the like, reports on the activities of the various lodges, and advertisements for the order's various books, services (absent treatment), emblems, incense, membership apron, candlesticks, identifying stickers for cars, etc. On Lewis's death in 1939, the journal printed his last will that assured the order "I shall be present to console and strengthen all of my beloved ones during the trying hours immediately after my transition and even unto the last minute of depositing my ashes in the earth. Then I shall depart for a while, but will ever contact my beloved ones in their hours of sorrow, and my loyal, advanced Fratres and Sorores of the Rosy Cross in their sublimest moments of Spiritual attunement." His son, Ralph, succeeded him. On Harvey Spencer Lewis (1883-1939), see the note under American Rosae Crucis. The bibliography of Lewis's early publications, including his journals, has been set out by David T. Rocks, "H. Spencer Lewis: A Bibliographical Survey," Theosophical History 6/6 (April 1997): 219-227. NYPL microfilm; LOC; Cornell University; Columbia University; University of California, Berkeley; Buffalo and Erie County Public Library; and many other locations in OCLC; ZDB: München BSB; Leipzig DNB. Additionally, an index of the Rosicrucian Digest from 1948-1952, likely from the same source, is also available.